Join Dr. Seth for this month’s Movement and Performance Series Workshop on Saturday at 12:15. This one’s all about shoulders. Show up, collect some tools and make yourself better! I know CrossFitters tend to be a little crazy, so this might blow your mind … it’s JUST a workout. At the end of the day, who gives a sh*t how fast you did “Fran.” Don’t get me wrong, for those who use CrossFit as a full-time profession, it does matter. But for the rest of us (most of us), it’s a means of getting off our asses, staying in shape, looking good naked and challenging ourselves. So when things don’t go as planned, please remember that it’s just a workout. 1st 3 people to email us at swamprabbitcrossfit.com the 9 foundational crossfit movements get a prize. 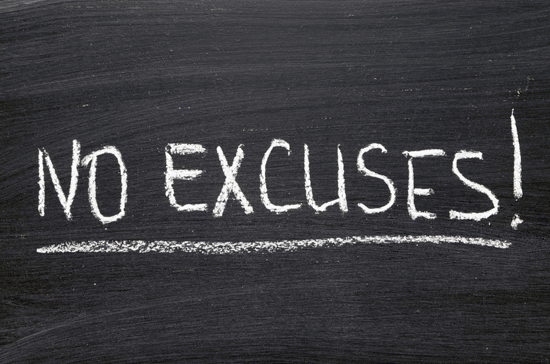 Excuses may help you feel better about a poor performance, but they change nothing. So screw the excuses. Learn to take ownership for your accomplishments and your shortfalls.